Freedom Machine Tool (FMT), a subsidiary of Diversified Machine Systems (DMS) is proud to debut the newly-released FMT Patriot 5x10 machine at the AWFS Fair on July 24th-27th, with show floor demonstrations to thousands of anticipated attendees. Latest improvements include a full Fagor control, amplifier, servo drive package (2-year limited warranty), absolute encoders on the brushless AC servo motors, larger bridge package, expanded 8-position tool rack & redesigned dust hood. Freedom Machine Tool, a leading manufacturer of quality, precision, and reliable 3 axis CNC routers for woodworking applications and solutions, has provided innovative machines to address the machining needs of the marketplace for many years. The unveiling of the new FMT Patriot 5x10 machine at the AWFS Fair has been met with great anticipation and is being showcased in booth #7632. "The first FMT 5x10s are in the field and the customer response has been fantastic," Bill Oberg, Sales Manager at FMT, enthusiastically states. "It’s an exciting addition to the Patriot product line, and it gives prospects a larger machine alternative for those applications where the table size is critical." AWFS® (Association of Woodworking & Furnishings Suppliers) began in 1911 in California as a supply company for the California Furniture Manufacturers Association, and then became a separate entity in 1979 to focus on representing the interests of companies and individuals who supply the home and institutional furnishing manufacturing industries. AWFS focuses on education shown by its college of woodworking knowledge (CWWK®); innovation shown by its product showcases dedicated to represent maximizing productivity and staying competitive; and, connections shown by its ever increasing capabilities to network the largest woodworking and machining leaders from around the globe together in one location. The AWFS Fair has become a nationally-valued resource for woodworkers looking for solutions that allow them to work smarter and more efficiently. FMT’s new Patriot 5x10 is designed to surpass these objectives with its improved features and design. The debut of the FMT Patriot 5x10 has given way to questions and speculations on what will happen to the older products in the FMT line. Many are curious about the future of some of the previous models because of the recent discontinuation of the Patriot 4x2. Bill Oberg assures us, "The 4x2 and 4x4 pricing were simply too close together to differentiate the products. The Patriot 4x4 is very popular, with wide-ranging applications - the smaller machine didn’t fit as large a need in the field. We hope by eliminating the 4x2 we will create a more concise, intuitive, and ultimately more purposeful product line." We hope to see you at booth #7632 to experience the Patriot 5x10 during one of the live at-show demonstrations. 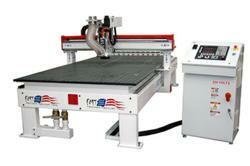 To learn more about Freedom Machine Tool, visit us online at http://www.FreedomCNC.com. Diversified Machine Systems (DMS) is a leading designer and manufacturer of 3 & 5 axis CNC routers & custom machining centers, with headquarters in Colorado Springs, CO. With more than 30 years of innovation and industry experience as an Original Equipment Manufacturer, DMS’ line of CNC routers and machining centers are routinely used on materials such as wood, composites, aluminum, steel, plastics, and foams. Renowned for quality and precision, our advanced machining centers are engineered to increase efficiency and productivity, while maintaining the quality and precision our customers have come to expect from DMS. Freedom Machine Tool (FMT), a division of Diversified Machine Systems (DMS), is a manufacturer of affordable, 3 axis CNC routers. Located in Colorado Springs, Colorado, FMT was started to address the need in the market for a cost-effective, industrial quality CNC machining solution. With over 25 years of combined experience building CNC routers, the FMT development team is committed to producing a value-priced router without sacrificing on quality or reliability. For additional information about Diversified Machine Systems and Freedom Machine Tool, please visit: http://www.dmscncrouters.com and http://www.freedomcnc.com.